The new settlement usually was surrounded by the fortifications in the form of a moat and earth ramparts, probably topped with a palisade. Likely, to build these fortifications, the ruler used the local population, obliged under the prince’s law to build fortifications. The construction of brick walls in the medieval town meant large-scale construction task, requiring a large involvement of working forces and financial resources. As part of the duties related to the personal participation in the defense of the town, the town walls were erected by townspeople and residents of the suburbs and surrounding villages under the municipal law, as well as day-laborers hired for this purpose. Financial resources were obtained from specific taxes for the construction of fortifications, as well as through penalties that were worked on during the construction of the walls. 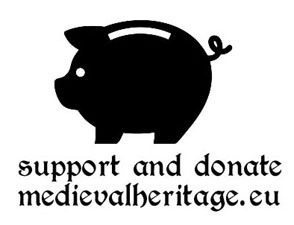 In relation with the expenses for the construction of town fortifications, the rulers granted economic privileges to the townsmen, lowering or abolishing taxes for a certain time. 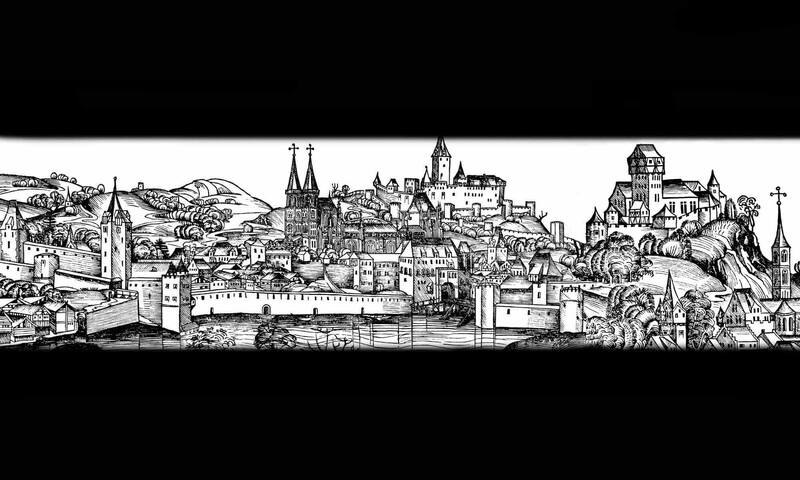 It is known, for example, that in 1404 Prince Jan I released the burghers of Glogów from the land court fees in exchange for help in building a new castle. It seems that at first brick fortifications were erected at crucial points, which were town gatehouses, and only later curtain walls were built, filling the remaining spaces between gates. The gate towers usually had a four-sided plan with passages at the level of the ground storeys. Another model were flanking towers set next to the gates pierced in the wall. The circumference of the walls was strengthened with towers on all or on part of the circuit of fortifications. Initially, they were usually half towers, open from the town side or sometimes protected by wooden or wood-clay walls, which significantly reduced the construction costs, and at the same time, if they were captured, did not allow the enemy to use them fully against town defenders. Changes in the siege technique that took place in the fourteenth and fifteenth centuries had to be reflected in new ways of defense, which resulted in the reconstruction of town fortifications. Until about the 14th century during the sieges of cities, conducted in a frontal manner, from relatively short distance, crossbows, ballists and various throwing devices were commonly used. Accordingly, efforts were made to organize a defense so that the defenders would be higher than the invaders. From the end of this century, in military operations, hand-firearms and portable bombards on timber beds and carts were increasingly used. The use of a new weapon meant that the defensive elements of towns and castles were increasingly transformed from vertical systems to horizontal ones, thanks to which the location of the firing and ejecting missles sites was lowered, whereas so far often absent arrowslits appeared in the walls. The defense line has been extended so that the enemy move as far away as possible. This was particularly evident in the construction of the second ring of fortifications in the fifteenth century, often reinforced with low, semicircular bastions. Additional strengthening was gained at that time by gates, which were often doubled and joined with walls forming long necks. The peak point of development of the foregate in the Middle Ages is the barbican, almost independent defensive work. A certain role in the defense of the town could also be played by monasteries and churches. Their advantage was that they were often buildings and complexes of buildings quite quickly erected from durable materials, and therefore difficult to burn and break. The high church towers, which often served as watchtowers and observation points, were not without significance. Sacral buildings, apart from the aforementioned utilitarian functions, constituted an apotropaic element within the fortified complexes. The location of the monasteries along the town walls and parish churches just behind their curtains, gave the defenders a sense of guardianship of the divine forces. The defensive values ​​of the town could also be increased by knights’ residences, built at strategically important points, sometimes as defensive houses. The fortifications of the medieval town were primarily protected by its residents, whose main occupation was craft and trade. 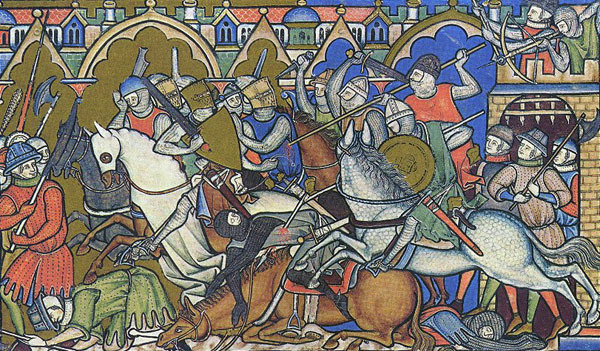 In the Middle Ages, war and violence in various forms were a common phenomenon of everyday life, which forced the continuous readiness to defend and the presence of a permanent guard and watch in the town. The burghers’ striving for autonomy was also aimed at self-determination in matters of defense and organization of defense. Often, after the city council was established, attempts were made to take over the competences of the organization and the command of defense, resting in the hands of the mayors acting on behalf of the territorial rulers, burgrves and starosts. However, based on the military strength, striving for independence of the towns required considerable personal and financial costs from their residents. The defensive ability of the town was ultimately dependent on its economic and financial position, which was usually not sufficient. Most often, therefore, the burghers were obliged to take part in the defense of the town personally, and their duties included: services in the form of various types of physical work, expansion and maintenance of walls and moats in good condition; constant guard service by day and night, later also in crews on towers and walls and in night patrols on the streets; military service during the defense of the town and during long-distance armed expeditions. That the problem of maintaining order in the town played an important role, can be witnessed, for example, by the rebels of the Głogów poor burghers in the fifteenth and sixteenth centuries. In 1450 there was even a rebellion of urban weavers against the patrician, during which the mayor lost his life. The military division of the population obliged to participate in the defense of the town was often topographical and based on urban quarters, according to the streets from which the units were made. Sometimes this division was organized according to belonging to a specific parish or corporation (guild) from which armed squads were created. Quarters and guilds were assigned to defend and guard specific sections of the walls, towers, and town gates. The division according to guilds had the advantage that their internal structure and hierarchy could be used. However, such an organization also had some disadvantages resulting in the danger of a late response to the threat, because guild representatives living in different parts of the town first had to meet at the assembly site, while the topographic division according to neighbors and even family units could be faster. 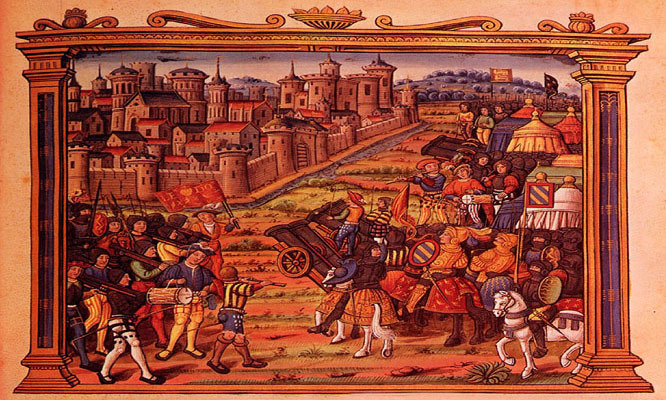 The inability to participate personally in normal working life, resulting from the necessity of military-police service, led to the fact that at the latest from the fourteenth century the responsibilities of townspeople and armed expeditions organized outside the town, were taken over by qualified representatives, for which the appropriate taxes were paid. By expanding the financial organization and position, the townspeople were able to gradually give up their personal participation in military services, transferring these responsibilities to skilled workers and armed urban crews. The danger of conflicts growing over time meant that sometimes the general duty of guarding returned. Armed townspeople, however, were often too small a group to fill extensive town fortifications, so city councils had to seek reinforcements among the mercenary forces. Large cities could afford to rent appropriate mercenaries, dealing with escorting travelers and transporting various goods, organizing expeditions against local robber knights, and serving patrols in the town. In turn, to meet the needs related to the need to maintain contacts with other centers, small groups of horse soldiers were hired, serving as messengers and runners. Taking care of own interests, including, first of all, ensuring the continuity of profitable long-distance trade, often resulted in agreements and alliances between several towns regarding mutual assistance and support in the event of various threats, be it in the case of combating robbers or help in the event of fires. Sometimes such agreements were concluded by representatives of various states, as evidenced by the act from 1410, in which the promise of mutual help was made by representatives of the Polish and German knights and the burghers of the ducal part of the Duchy of Głogów. Such pacts were most often organized at the moment of chaos associated with the weakening of the princely or royal power. This was mostly related to the death of the ruler or planned division of the land. The alliances between the knights and the townspeople sometimes guaranteed the towns the right to use the nearby castles, that served as municipal bases and starting points for patrolling wider territories. Small fortified buildings during military operations could sometimes also serve as logistical points. For example, it is known that in 1480, the townspeople from Głogów, plotting against Prince John II of Żagań, parceled out the equipment in the Głogów Castle, including armament and food. Obliged to carry out fortification work and participate in the defense of the town, the population had to take care of the tools and weapons. The quality and quantity of the armament which the townspeople had at their disposal was therefore dependent on their financial status. Compensations from the municipal coffers were paid only for the suffered losses, and the towns also bought the prisoners of war from captives. Who was not able to provide himself with full weaponry, received such from the municipal or guild armory. Most often in this case, it concerned poor people with small incomes, which served as the knechts, sometimes armed only with spears. Over time, these mostly small armories, or rather warehouses, were no longer sufficient and were gradually replaced by municipal arsenals. As mentioned, later the widest possible parts of the society were drawn into military service, which arsenals provided the supply of possibly uniform and modern weapons. The storage of bourgeois weapons in the arsenal also facilitated control over its users and its maintenance in good condition and inventory. Often, the arsenals were therefore a place of work for professionals specialized in the repair and production of weapons. In the period in which gunpowder was not known yet, bows, crossbows and larger throwing devices, operated by several people, were commonly used as an offensive weapon. Apart from them, when occupying the town defensive walls, pole arms were also used to keep distance with the attackers. 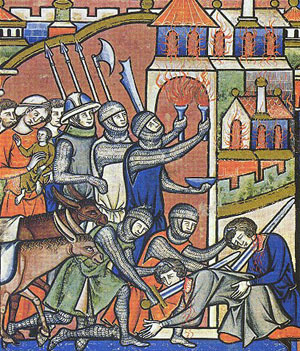 As it seems in the thirteenth – fourteenth century the crossbow was especially popular for the equipment of urban crews. Due to the etiquette, which did not allow for a surprise attack and under the influence of papal bans, this weapon was not popular among knights, but it was perfect, however, as an armament of urban crews. When defending the towns, the crossbow was almost irreplaceable as an extremely effective and at the same time easy to produce and use. Armament stored in the town’s arsenals, gates and towers in the middle of the fifteenth century can be traced on the example of Głogów town. There were a total of 18 small and large guns and a bombards (bochssen gros und cleine), among them were guns carried on the appropriate beds (tarres bochsen). In turn, in the weapon lists from 1447, 1475 and 1479, we find informations concerning, above all, the elements of protective equipment. 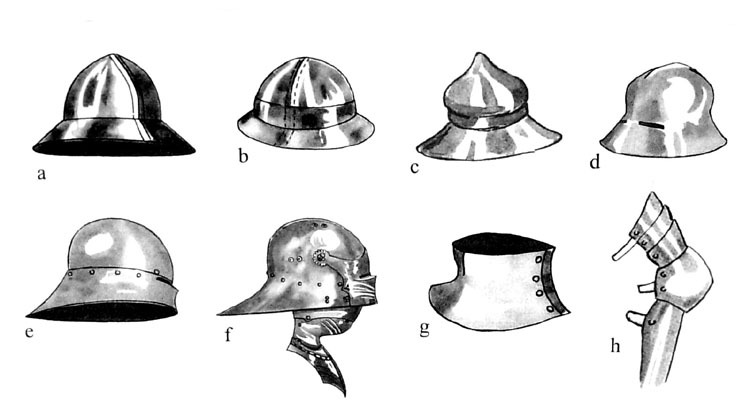 The oldest inventory lists: sallet helmets (lipken), kettle hats (hwte), including profiled ones, reminiscent of hats worn by Jews (judenhute), breastplates (broste), parts and entire plate armors (plate, gancz platen), gloves (hanczkeu), vambraces (mawseyszen), chainmail armors (panczer), fauld armors (schurcz), collars (kolner), knee pads (dylinge) and a dozen or so shields (schilde). With a large part of the weaponry it was marked whether they were elements made of polished balch (blancke), or painted or covered with material (swarcze). As you can guess, helmets and gloves were decorated or protected against corrosion and the breastplates were covered with the materials. The document from 1447 is also the oldest written document confirming the use in Silesia of the so-called white cuirass, that is a breastplates not covered by any material. On the other hand, iconographic sources indicate that they were already known in the second half of the 14th century. The next list from 1475 mostly repeats the older data, although there is the significant difference is the division of arms into new and old ones. The following were also mentioned for the first time: chin (barts), chin breastplates (broste mit berten), ordinary sallet helmets and sallets with klappvisors (reyne lipke und uffslege). In addition, various types of offensive weapons were mentioned, such as: flails (flegil), crossbows (armbroste) and swords (swerte). In the youngest record, there are also information about two shields of pavise type (pafoszen) and hand cannons (hackinbuchszen) molded by master Andrew, and thus probably bronze, after which iron hand cannons (eyszern hackinbuchszen) were mentioned. The information about the mould master seems to be particularly important, showing that at the end of the fifteenth century some firearms could be produced locally. Elements of burghers’ armaments are rarely found during archaeological research. 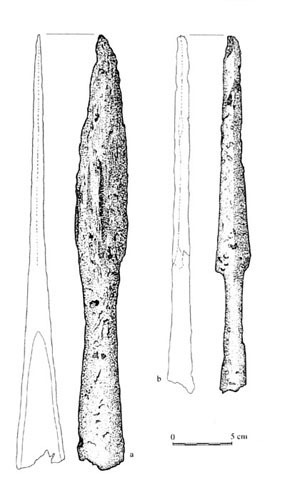 In the area of ​​Głogów, examples of the weapon discovered in this way are four spearheads of pole arms, only two of which are undoubtedly medieval specimens. The first of them has a long lanceolate and relatively narrow tip and a fairly long and wide sleeve for deposition on a massive spar. It was a well-known type and used in the early and late Middle Ages, one of the most commonly found in archaeological material. Over time, the shape of the spearheads underwent evolution, so that it gained a form that increased the penetration power, and thus their effectiveness in the fight against the opponent dressed in armor or plate armor. The spearhead became narrower and obtained a polygonal, often four-sided cross-section, resembling a thick spike. This variant is represented by the second spearhead found in Głogów. While in the early Middle Ages, spears were weapons of horse and foot warriors, they later lost their importance in the knight’s cavalery, where lances took their place, but they were still used by foot soldiers and during hunting. Two halabard heads have also been discovered in the Głogów town. In the light of research, this type of weapon lost its significance from around the mid-sixteenth century, giving way to more and more places of firearms. However, they were still used as ceremonial and representative weapons. 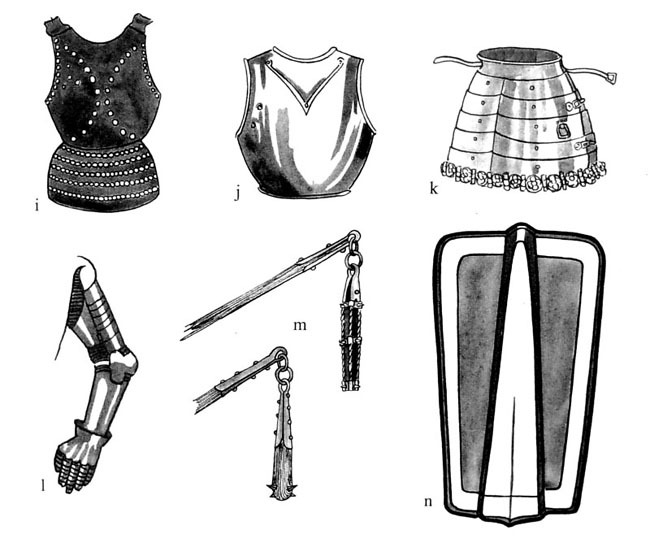 Armaments traditionally also include parts of the horse’s row and equestrian gear. The first ones are bits, the second category is represented by the most frequently discovered spurs, mostly late medieval ones with a strongly profiled bail and a rowels in the form of a star wheel embedded in a fork. Although spurs, as well as swords and belts were commonly connected in the Middle Ages with the knighthood, they were also often used by representatives of other social groups and various professions. As objects that are easy to make and usually of low material value, the spurs were not usually repaired, and damaged specimens were usually thrown away, hence these are often found in archaeological materials. The weapon lists of the arsenal mainly mentioned protective armaments, including mainly elements protecting the head and corpus. Perhaps this was due to the fact that this weapon was intended for the crew, whose town fortifications (breastwork, battlements), provided cover for the lower parts of the body. It is also meaningful that in inventory in general, or only sporadically, there were examples of offensive weapons. Also in this case it was a different type of weapon than the specimens discovered during the excavation. It can therefore be assumed that at least some of the weapons, such as spears, were handheld equipment and was kept in homes. The post was based on the article of Dominik Nowakowski “Elementy obronne średniowiecznego miasta i broń w mieście na przykładzie Głogowa w świetle źródeł pisanych i archeologicznych”, published in Głogów, średniowieczne miasto nad Odrą, Głogów 2018. Used graphics: the manuscript so-called The Bible of Maciejowski, Memoirs of Philippe de Commynes, a drawing of the town of Złocieniec by M. Merian, examples of weapons according to Wagner, Drobna, Durdik, Tracht, Wehr und Waffen des Spaten Mittelalters, Praha 1960.